History shows why Restore Inner West Line is needed. "The decision to construct a railway from Regents Park west to Cabramatta... to avoid the congestion... of the main Western Line"
We draw your attention to Transport for NSW's statistics as reported in the Sydney Morning Herald on 16/02/2015 (http://www.smh.com.au/nsw/crisis-looms-for-sydney-train-commuters-20150213-13eao8.html) that the Western Line particularly between Strathfield, Lidcombe, Granville is at crisis point due to overcrowding. We have recently read some local history of Liberty Plains and have discovered that that one of the main reasons that the Lidcombe to Cabramatta via Regents Park train line was constructed around 1924 was to alleviate pressure from the Western Line especially between Lidcombe and Granville. 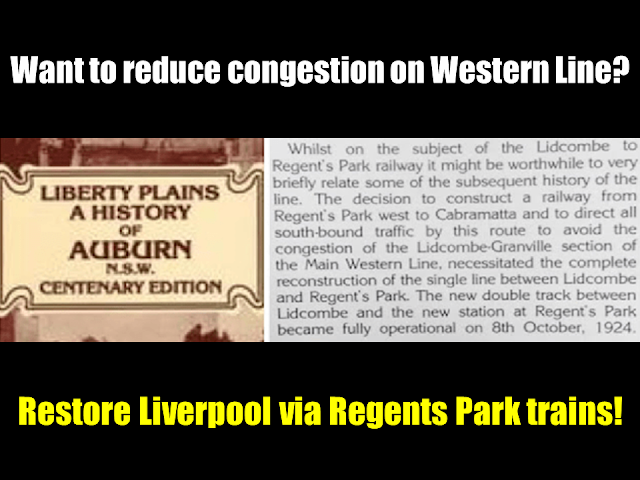 On page 189 in "Liberty Plains A History of Auburn NSW", the historian/book's author states that the decision to construct a railway from Lidcombe/Regents Park to Cabramatta is to avoid congestion of Western Line. Your predecessor Gladys Berejiklian removed the regular Liverpool via Regents Park train service on the Inner West Line as part of the Sydney Trains timetable change on 20 October 2013 claiming that separating the Inner West Line from the Western Line's rail corridor would improve the Western Line. This has clearly not happened and in fact Transport for NSW's statistics show that overcrowding is worsening on the Western Line while the Lidcombe to Cabramatta via Regents Park route (which was part of the Inner West Line under 20 October 2013) remain largely unused. We ask that the State Government reconsiders its position towards suburban train services for the communities of Homebush to Flemington, Lidcombe, Berala, Regents Park, Sefton, Chester Hill, Leightonfield, Villawood, Carramar, Cabramatta, Warwick Farm and Liverpool. The Sydney Metro to Bankstown and WestConnex is not a relevant solution to the public transport needs of the commuters from the suburbs listed above. Neither is the extra 1000 Bankstown Line trains helpful to the area in question as these additional services mainly benefit commuters east of Bankstown. Terminating the Bankstown Line at Lidcombe may have been reasonable to take away Bankstown trains on the Western rail corridor but removing the Liverpool via Regents Park train service leaving effectively unused tracks between Lidcombe and Cabramatta via Regents Park when the community is calling for more trains not less has been a step in the wrong direction. I want to know what the government will specifically do to improve public transport for the communities and commuters of Berala, Regents Park, Sefton, Chester Hill, Leightonfield, Villawood, Carramar. What will the government do to rectify the worst downgrade in a generation?